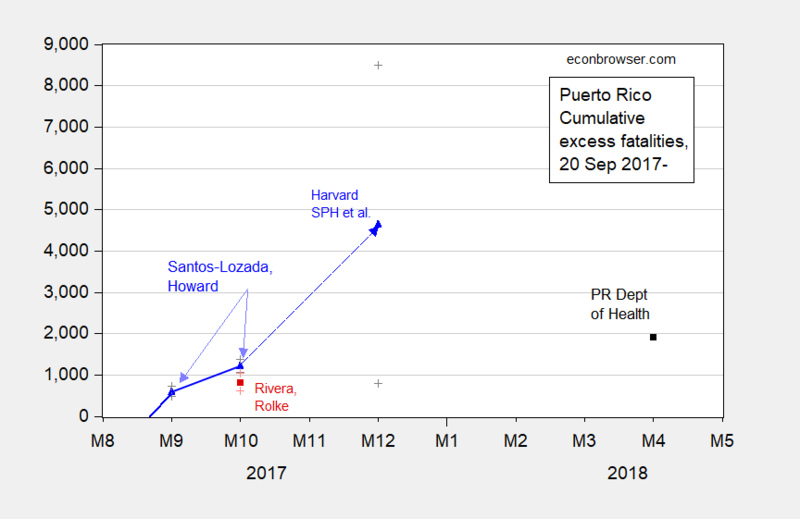 The Puerto Rico Department of Health has released official data, up to May (May data can be updated, so is as of 6/1). Figure 1: Official death statistics, by month, from Puerto Rico Department of Health. Source. These data are “harder” than survey data moments that include sampling error. However, that doesn’t mean that the data are without measurement error. See this article for some discussion of the issues surrounding the use of administrative data. Hence, the level of the death count (as opposed to the inferred excess death count) should be considered a lower bound. Here is a graph depicting how this number relates to the other estimates that have been produced, including the most recent Harvard School of Public Health estimate discussed here. Figure 2: Estimates from Santos-Lozada and Jeffrey Howard (Nov. 2017) for September and October (calculated as difference of midpoint estimates), and Nashant Kishore et al. (May 2018) for December 2017 (blue triangles), and Roberto Rivera and Wolfgang Rolke (Feb. 2018) (red square), and calculated excess deaths using average deaths for 2015 and 2016 compared to 2017 and 2018 (black square), end-of-month figures, all on log scale. + indicate upper and lower bounds for 95% confidence intervals. Cumulative figure for October author’s calculations based on reported monthly figures. The lower figure of 1908 as of April still exceeds the oft-cited estimated death toll from Hurricane Katrina of 1836. Update, 8:45PM Pacific: Santos-Lozada as of a couple hours ago estimates 1140 excess deaths as of December using PR Health Department numbers. He stresses the point that 2018 numbers are incomplete. So, first, let’s thank David Begnaud of CBS for getting this data for us. I wager that Glenn Beck still takes payola from quacks, losers, and flakes. I’m sure with the modest (and diminishing after each broadcast) IQ of Beck’s demographic of listeners, they’d be very receptive to your views on this topic. Or any topic in the broadcast time payed for. I hear the angry southern rednecks are particularly receptive to paying exorbitant commission fees for gold. They also put full faith in pedo judges running for U.S. Senate (about 91% of registered Republicans in that state). I maintain high confidence that your lessons on bad mathematics and amateur statistics sampling could gain strong traction with this group. This post specifically makes me think of The Chinese Exclusion Act. That sounds a very strange/abnormal thing to say. No doubt it is somewhat connected to the fact due to PBS and Menzie’s discussing it, The Chinese Exclusion Act has gone from something way in the back of my mind up to the forefront of my mind. But it sounds unnatural to connect these things, yes?? But the reason it makes me think of it, is I think most Americans would find nearly unfathomable that we would allow 1908 (sure to break 2000 easily in the final count) of our fellow citizens die, with very little news or mainstream documentation of the fact. This is similar to most white Americans near shock (shock seems too strong a word, but some emotion/sensation very near it) when finding out about the Chinese Exclusion Act. There is some kind of “momentary” cognitive dissonance there where white Americans (such as myself) go “no, that can’t be true” or “No, somehow you have the particulars wrong on this” or “I know Americans were more ‘backwards’ and higher rates of illiteracy back then, but this seems off”. I consider myself broad-minded and educated and yet when I learned of The Chinese Exclusion Act (sometime in my late teens probably) I was “struck” or “jolted” enough to really want to find the contradicting fact that this hadn’t happened to the degree the facts would eventually show very true. Wow, every time you think the average American could not become any more apathetic than they already are, they find a way to top your expectations. I guess Americans care more about dogs and cats in those sad late night TV ads than we do human beings. We can see some modest revisions up for Sept and Oct, and material revisions to Nov. and Dec. Therefore, I think conservative estimates should work two months back, ie, March should be the last month we use. The total revisions through year end are thus an addition of 825 and which brings the year-end total to just under 1400. This is good news and bad news for the Harvard study. The good news is that 1,400 is better than 654, in terms of being closer to the Harvard estimate (not in terms of deaths, obviously). The bad news is that these numbers now look firm. The actuals are still 3,250 off the Harvard total, and these bodies were not recovered through the end of May. Therefore, unless the Harvard team can find another 3,250 unrecovered bodies or show that they died somewhere outside Puerto Rico (in which case attributing their death to Maria is in any event problematic), it is time to retract. Deaths of 4,645 on actuals of 1,400 is a 2.3x error. Way too big for government work. I think ‘garbage’ is a bit harsh, not because the estimate wasn’t garbage — it was! But because I know the Harvard team worked hard and they tried something new. Sometimes it works, sometimes it doesn’t, but the team leader should never have allowed the publication of the study without reconciliation to actuals. Just a visual inspection of data through October would have suggested a 1200 – 1300 total, an error a fraction the size actually recorded for the survey data. Harvard should retract or qualify. Obviously, the revisions were upward, so the monthly totals should be positive. Steven Kopits: First, this is not government work; it’s a work of research, conducted by private nonprofit affiliated organizations. Second, the 1400 number is easily encompassed by the 95% confidence interval that the authors highlighted. Third, it might very well be the case that when the infrastructure is repaired, we may have additional adjustments to the September-December numbers. What happened to your upper bound of 400 excess deaths? Government work: I believe I was making a bit of a joke. So, the estimate — I don’t know that I used ‘upper bound’ — of 400 was dependent on the available data. With new data, the estimate changes. At this point, we cannot say for certain whether the trend has changed or not. Yes, I would still expect that the increased deaths should reverse. If I believe the April data, that reversal has already begun. But I don’t believe the data is firm enough to make that statement. Best guess? Maybe we get back to 800 increased deaths by Oct. 1, 2018, but we don’t have enough credible data at this point to make that call. As for 95% confidence: The press published 4,600. CBS did it just today! That number is plainly wrong, unless the team at Harvard has some bodies up their sleeve. It is fake news, yes. Begnaud posted this on Twitter. I think Begnaud’s tweet would have been before “Princeton” Kopits belly-aching. Begnaud’s tweet connects to a WaPo fact-check that gives deeper explanation on the 4,645 number. Menzie, you most likely know everything in the WaPo fact-check already. I very much doubt, but do not “know” Begnaud was portraying the 4,645 as a “hard number”. Not even during the broadcast. If I find the actual specific video, I will put it in this thread within 36hrs. For the first three months of 2018, the total excess deaths amounted to 209. If we include April, the result is pretty close to a wash. However, given the scope of revisions to Nov. data once the December initial data was in, I think we drop both April and May for purposes of analysis. This suggests some continued elevation of mortality in the first quarter of this year, which if it holds up, would amount to about 1,600 total excess deaths through Q1 2018. Steven & Menzie, I think we have reached consensus on the Harvard study. Kopits now concedes that that there has been at least 1600 excess deaths. His own analysis said 200 to 400 meaning Kopits’ analysis was off by a factor of 4.0x to 8.0x. By Kopits’ definition, this would means his own analysis was garbage squared. Kopits has frequently demonstrated his incompetence with simple math. Recall that he once calculated that Obamacare cost the government $35,000 per insured based on his inability to read a simple line graph — curiously off by a factor of at least 7x. Seems to be a pattern. Seriously, if this is an example of your work, do clients pay you for your garbage analysis? I did not concede it. I added up the total provided by the Puerto Rican government, then as now. 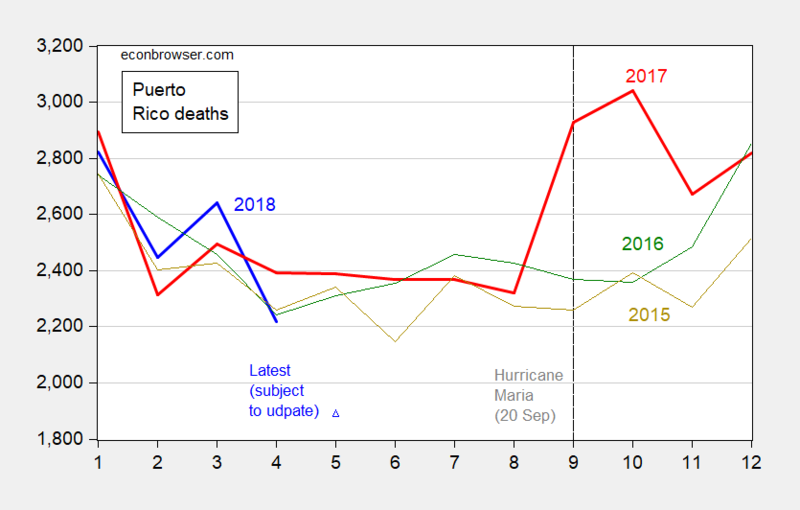 My calculation of excess deaths to October 1, 2018 were based on PR government data which included December. They revised the December data up, I revise my estimate up for excess deaths through Oct. 1, 2018. The study is almost certainly wrong. According to a NYT report citing the Demographic Registry of Puerto Rico — where deaths are recorded — the incidence of death over expected numbers totaled 1,052 through Oct. 31, 2017, with clear signs of the count leveling to the end of the period. By contrast, the study claims a total of 4,645 excess deaths during this period September 20 through December 31, 2017. Even if we allow deaths recorded at the pace seen in October, the total to year-end 2017 should not have exceeded 1,500. Unless the study authors are accusing the PR Demographic Registry of gross incompetence — having missed some 3,000 deaths in little more than three months — the study numbers are garbage. That interpretation still looks solid. The most troublesome thing about this whole episode is, I’m afraid that “Princeton” Kopits may lose that long-term contract he has auditing Pentagon expense receipts. If all else fails, “Princeton” Kopits could get a job estimating attendance numbers at Trump events. Steven Kopits: Let’s just be straight, and distinguish between what the researchers wrote and what the newspapers wrote. The researchers quite clearly laid out in text and graphically (including one I reproduced in my post) the confidence interval. And at least one newspaper — the New York Times — did indicate the 95% confidence interval. We report point estimates all the time in empirical policy work, at least when it’s done correctly. To not do so is problematic. You provided a range that was based on administrative data that was sure to be revised, and in fact your upper bound is now demonstrably wrong. Hence, your cited “range” confered a misleading sense of accounting for uncertainty, when the manner in which you did so did not conform to standard methods of statistical inference. I’ve always been a HUGE fan of Susan Rice’s. She obliterates every negative racial stereotype in the book. If this country ever gets back on the railroad tracks again, this woman will have a high position in that hypothetical administration. Her mind is sharp as a razor, she has a broad lexicon, communicates well, keeps her calm under verbal attacks, and is loyal nearly to a fault—as exhibited by her silence when President Obama left her out cold blowing in the wind after her Secretary of State nomination. Think where we have gone as a nation in a relatively short period of time on classified intelligence clearance. A more than qualified, hyper-educated black woman who had worked side by side with the likes of Madeleine Albright, being denied Sec of State for ZERO reason, to clueless cuck d**chebag Jared Trump getting clearance for membership into the NSC. Jared getting NSC clearance for what?? So wonderboy wanna-be Jared can have leverage when he goes panhandling for TBTF bank loans with sweetheart terms?? You based your declaration of garbage on your number of 200-400. You based your claim of “phantom deaths” of 4000 on your number of 200-400. Turns out that your analysis is off by 4x to 8x. The Harvard Study gave a confidence range of 800 to 8000 with a median of 4645. So subsequent data shows the Harvard study to be confirmed while your “analysis” continues to be “garbage,” according to your standards. You really should give up on the math stuff. You repeatedly embarrass yourself. Joseph, why are you being so irrational. Steven’s article was based upon the best available “official” data at the time. How did Steven lie? He has changed his estimates when the “official data” changed. How rational is a comparison of estimates, one based upon those best available “official data”, and the other using “sampled survey” data. The study based upon “sampled survey” data “…gave a confidence range of 800 to 8000 with a median of 4645.” Since when has a 1:10 range considered meaningful and of value when “official data” exists? Instead of criticizing Steven you should be critical of the Harvard group for providing a valueless study. You don’t even seem to understand that you are actually criticizing the Puerto Rico Department of Health, and not Steven. You are embarrasing yourself. CoRev: Anybody who works with data in an intelligent fashion — administrative or otherwise — should understand the nature of the data. No point in looking at the most advance GDP release and treating it as set in stone — unless one is a data dotard. It’s something that I teach my students in public policy. It’s something that people trying to do policy analysis should understand. Menzie, what is your point in both your response to me and Steven with this article? Are you saying you think the Harvard study is better than the studies based upon Puerto Rico Department of Health efforts data collection? If its the latter then its a slap at their efforts after maria’s devastation. Anybody who works with disaster related data in an intelligent fashion knows that the initial reports are always wrong, and it takes time for the reporting to settle down. if you think the Harvard study is superior, I just don’t see it. What kind of policy can/should be implemented with such imprecise data? We both know that most such disaster policy decisions are linked to Federal Funding. How can the policy be prevented from under/over shooting using the Harvard data? CoRev: No, my point is (1) there are multiple ways of assessing a given (unobservable) number, (2) some ways are more reliable than others in different situations, (3) a study is not “garbage” if it hews to established protocols for scientific research, (4) administrative data contains its own biases, especially when the bureaucratic infrastructure is damaged or otherwise inhibited in accurately reporting data, (5) that those the do not understand statistical inference should not be commenting on methods of statistical inference. Menzie. you’re killing me. No, to both my suggestions or no to only one. (1) there are multiple ways of assessing a given (unobservable) number, of course, by latest count I observed we are up to seven estimates. I am including Kopits revised numbers in the thread. (2) some ways are more reliable than others in different situations, yup! (3) a study is not “garbage” if it hews to established protocols for scientific research, Not true. Using established protocols do not assure scientific research resulting in good or even usable results. There are too many variables to discuss. (5) that those the do not understand statistical inference should not be commenting on methods of statistical inference. ??? This was not ‘an advance estimate’, Menzie. This was a big time error which was used to impugn the integrity of the administration. It had a large political component. Now, given that we have actuals, Harvard is either going to have to stand by the work, or disavow it. There will be no hiding behind confidence intervals. By Wednesday, this will be litigated in public on Fox and other conservative news networks, and red state voters, Republican Congressman and the White House will believe — with good cause — that Harvard SPH lied to them. And I think the CDC is going to go ballistic, because the red state read on this is that public health officials are partisan and cannot be trusted. That’s the way it’s going to play out, unless the the Harvard team has 3,250 bodies it can produce on short order. If I’m the Dean of HSPH, I’m going to have put some serious distance between the institution and the study by close of business Monday. More realistically, by 2 pm. Steven Kopits: Harvard SPH “lied” to them? To whom? The study was financed as far as I can by nongovernmental sources; they are not “public health officials” — they’re researchers that by and large work at a school of public health (or medical school). The article was peer reviewed. Even critics laud the study for its timeliness and clarity. Santos-Lozada, who was quick to analyze the mortality data on 6/1, notes the confidence intervals in the Harvard SPH study encompassed his estimate for December 2017. Also in November, BuzzFeed reported that 911 bodies were cremated following Hurricane Maria without being examined, and that in many cases, funeral home and crematory directors believed that those people had died as a result of the hurricane. Maybe these were entered into the system. Maybe not. That tells me that we could discover in several ways more fatalities that could be ascribed to Sept. 20 to December 31, 2017.
so now corev takes “official” government data as accurate. and yet all the trump hacks who argued the “official” unemployment numbers under obama were massively incorrect were against “official” government data in the not too distant past. funny how they change their opinion to justify their ideology. apparently the puerto rican government is full of a bunch of trump hating liberals, and yet they produce impeccable death toll numbers in spite of such limitations. talk about having it both ways! Here is a woman reporting on the deaths and carnage of “Maria” in Puerto Rico for Kaiser Health News. I know most of Menzie’s readers are above average intelligence, but for some of the slower-witted commenters on “Econbrowser” (maybe the dull-witted type that likes to create the false impression they have any connection to Princeton University), I should point out that Kaiser Health News is a privately funded news service. Menzie, I’m a little worried about that 1140 number. Has Santos-Lozada double-checked that with “Princeton” Kopits?? The problem that conservatives like you and Kopits have is that you pick and choose the pieces of data that support your political philosophy and rejects all other data. The entire point of the Harvard study was to show that the “official” data was incomplete. This is understandable since most of the infrastructure — roads, water, electricity, phones — were destroyed. The “official” government functions were hampered from getting good data. The Harvard study went back to Puerto Rico to get more data. You and Kopits simply rejected that additional data out of hand because it conflicted with your political leanings. You didn’t just reject the data. Kopits said it was “garbage.” Now that other sources are confirming the Harvard numbers, Kopits stubborn slander of the additional data looks ridiculous. In the same manner, Kopits “calculated” that Obamacare cost $35,000 per person because politically he doesn’t like Obamacare. He didn’t stop for even one minute to consider that perhaps his nonsensical calculations were in error and meriting a second look. Joseph, I assume you are commenting to me. What data has been rejected? I haven’t rejected any data at all. I, in fact, used the data in the studies referenced by Menzie. Steven has accepted and recalculated his estimates as newer data was available to him. You should have read that reference as it describes some faults in the Harvard study, references Steven’s original numbers, and has a couple of take away points. This Fact Check was printed: by Glenn Kessler June 1 at 5:30 PM. Please note the newest Puerto Rican health department data release was in the past few days or even hours. Regardless after the data used by Steven. ” We report point estimates all the time in empirical policy work, at least when it’s done correctly. To not do so is problematic. All of these various studies are point estimates using different methods for establishing the expected deaths baseline for establishing what may be deaths in excess to it. Harvard’s survey method is almost always problematical, and Harvard’s estimates are significantly higher than all previous studies/estimates. With its huge range ~800 to 8000 deaths, it adds very little value. It remains an outlier. To paraphrase you: you didn’t stop for even one minute to consider that perhaps your nonsensical assumptions of being politcally driven and claims of data rejection were in error and meriting a second look. Does not anyone else have that sick feeling in their stomach that Harvard spent thousands (tens of thousands?) of dollars on this survey which will not save a single life? And I suspect the surveyors were healthy young people. How much better the impact would have been if those people who came from the mainland would have been spent their timebuilding and repairing things. The money could have been spent so much better on generators or building supplies or food supplies or even just bottled water or you name it. Think, according to the survey, they reached every part of the island. How many in need did they just pass by? Ed Hanson: Did you support the passage of a $1.5 trillion tax cut aimed at high income households and corporations? Excuse me if I think these are crocodile tears from someone who would’ve been content to console oneself about the Federal government’s relative inaction because only 64 people died. Yes, I supported the General tax cut and reform package proudly and would again given the same circumstances..
And I repeat, the Harvard Study will not save a single life. The money and time spent would have been better used to actually improve and might have save the lives of citizens of Puerto Rico. These are not crocodile tears but an honest assessment of the elite who think themselves and their academic studies being of greater importance then the lives of those they study. Nothing in the Harvard study would have suffered by a delay of the survey. In terms of priorities, the Harvard Study comes far behind what the money and time could have meant to Puerto Rico in actual improvement of the situation. Do you actually believe that corporations are the final payers of taxes, Menzie? I can not believe a sophisticated economist does not know that taxation is treated as a business expense by necessity and must be passed on to its customers. Over time, reduction of corporate tax rates, are a tax cut to the general populace. Menzie, how about you use your resources and contacts and find out the cost of the Harvard Study? With that information we will know if real tears are in order for us all. Ed Hanson I suspect that the Harvard study jolted you from your complacence as long as you could believe only 64 people died. Ignorance is bliss. The Harvard Study was an exercise in consciousness raising. And instead of that tax cut for the rich, why not spend some of that $1.5T on rebuilding PR? In terms of priorities, the Harvard Study comes far ahead of the money and time rich fat cats will spend on Trump’s global golf courses that will reap the benefits of his tax cuts. What shook me the most was the knowledge of how bad P.R. let the electrical infrastructure deteriorate over the last 30 years. That unfortunately meant that short term and quick repair to restore electricity was not possible for much of the island. Instead the more difficult, costly, and time consuming construction of the infrastructure was necessary. There is no doubt that lack of electricity is deadly. In fact, it would not surprise me that if it happened in the mainland like it did in P.R the death toll would be even higher. No slug, 64 deaths is far and away enough to awaken anyone from complacency. But a hurried and controversial survey does not add a thing. It is strange how you can not distinguish between a public legislature process and private action. But then again like most socialist, your ideal government is a dictatorial socialist who simply declares the law and money. Long live Cuba, and Venezuela. Maybe it is Harvard that should just dip into its excessive endowment and send it to P.R. And after hiding in the swamps for a while, that crackpot crony capitalist plan is back in the news. At least Harvard’s endowment serves some larger public purpose. Why doesn’t Trump dip into some of his supposed billions instead of unhelpfully tossing paper towel rolls? Oh wait, Trump doesn’t actually have billions anymore than Bernie Madoff had money. On with the show! exactly how would you conduct a survey in post storm puerto rico? leisurely on the beach next winter? my guess is you would simply prefer no attempt at a survey. Ed Hanson I’m guessing that you’ve not had a lot of real world experience designing quantitative studies, so there’s a positive externality associated with studies like this that you might not appreciate. Oftentimes high powered university teams aren’t only interested in the problem itself; they’re also interested in designing new tests and new approaches that can serve as a template for other researchers studying other problems. Standing on the shoulders of giants. That’s how science & research progress…that and funeral-by-funeral. What crap. Even if you assume that spending the money on relief for P.R. was thought of by anyone at Harvard (don’t laugh too hard, this thought comes under anything is possible) because relief is needed now and the study could be done later It would be immediately squashed by the words, “the victims be hanged, if we don’t do the survey now, someone else will get there first.” Publish or die, and the being first is everything. Ed Hanson: I wonder that you know so many things about Harvard, and yet I suspect you’ve never been on campus. I’ve step on the Harvard campus and even stepped on a campus of a quaint university in Madison. But I have dealt more with the elitist left. And with them the more leftist, the more elite, the more they think of themselves first. The fact is, my invented conversation would never have happened. No one at Harvard could conceive the idea of helping someone else with their own money. Gotta love the socialist. Ed Hanson: I think you have met the wrong sort of people at Harvard. While there are surely lots of elitists there, there are a bunch of people who worked hard, got scholarships, did work study while there (labeling call numbers on library books), working as a research assistant for Peter Navarro, took off time from school to save money on tuition and fees, and gave money when they could to Oxfam. Yours – Menzie Chinn, AB 1984. Don’t bother your contacts. Thanks to the Gelman blog, a member of the study says it took three weeks and less than $75,000. Imagine what that kind of money along with several youthful and idealistic volunteer could do for the welfare of the inflicted. so under trump the economy is “booming” and unemployment at an “all time low”. and you support a federal tax cut under those circumstances. brilliant. must be a conservative couch economist. The cost was $50,000, Ed. I don’t think it’s bad to try new stuff. I think it’s bad to take a flawed model and push it all the way through the mass media. Where did you et your 50,000 number. While 50,000 is less than 75,000, I find it a strange way of describing the cost of the survey as less than 75,000 since 50,000 is so substantially less. Not in anyway refuting the 50,000 number, just like to see the documentation. Given that the damage estimate for Puerto Rico is over $95 billion, I’d say not much. And given that Trump squandered over $1 million on his little photo op to Puerto Rico two weeks after the hurricane. Recall that Trump used his photo op to toss rolls of paper towels to the audience. He also stated that people no longer needed flashlights at a time when 95% of the population was without power. He also stated that all 69 hospitals were now open at a time when only one hospital was open. What’s a little lying among friends. I’m surprised he didn’t also claim that the biggest crowd in history attended his photo op. Hanson’s fake concern about $75,000 spent on a study just illustrates the utter depravity of the Republican soul. How many golf outings has Trump sacrificed for the people in PR? What we get from Ed Hanson is the clear voice of resentment. I hear that same voice and tone with a lot of my conservative friends and family members. In their minds a middle class kid getting a scholarship to an elite school makes the kid an “elitist”, but the Koch brothers are salt-of-the-earth folks who represent the American Dream. A college professor is an elitist, but a billionaire real estate wheeler dealer who used his father’s money to get into Wharton is somehow not elitist. Maybe Ed Hanson should have taken courses at Trump University, which we all know was a fine, fully accredited elite business school.